So much attention is paid to what people share on social media that we often ignore the why. Why do we turn to networks like Twitter, Facebook and LinkedIn to share specific types of content? Your social media presence can tell you a lot about your motives for sharing. Would you believe the common reason people post on social media is simply to share interesting things? This is the most popular motivator for 61% of people according to a recent report from Ipsos. 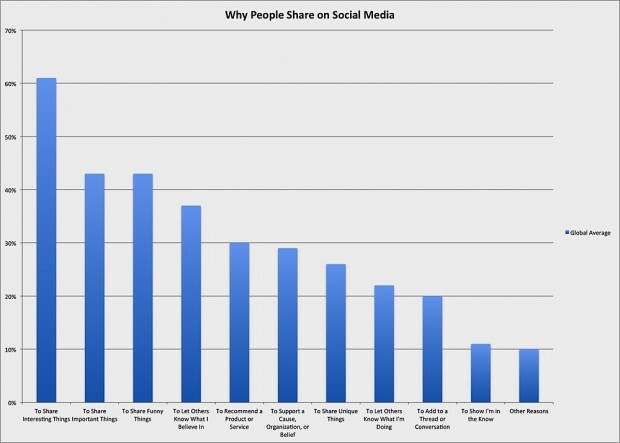 The second and third most common reasons for sharing are “to share important things” and “to share funny things” at 43% each. These stats show us that, contrary to popular belief, letting others know what you’re doing and showing people you’re ‘in the know’ aren’t our major motivations for sharing on social media. In general, we are much more motivated by a simple desire to share great content. And while finding great content is isn’t always simple, there are certain principles that we’ve come to understand make things ‘shareable.’ The Ipsos stats are a great indicator that people are starting to understand that emotion drives sharing. The journal Psychological Science published a study about the psychology of sharing in 2011. The research uncovered that evoking certain emotions can help increase the chance of a message being shared.Important and funny content are leading reasons for sharing because these types of content incite happiness, inspiration, fear, passion and other powerful emotions. There are also personal benefits to sharing in general. According to New York Times research, 73% of people say they “process information more deeply, thoughtfully and thoroughly when they share it.” Additionally, 85% of respondents said reading the responses of people to the content they share helps them better “understand and process information and events.” Since social media is meant to be social, and broadcasting is supposed to fall to the wayside in favour of discussion, this shows why so many people turn to this medium for sharing. This can all be tied back to the principle that— in the words of HootSuite Marketing Director Cameron Uganec— “stories are the way that humans make sense of the world.” When your colleagues ask you about a conference you attended or about how you spent your weekend, you don’t start with facts and figures, you tell them stories. Sharing interesting or important content on social media is just our way of continuing this storytelling tradition. Knowing why people share is an important part of succeeding at content marketing. If you business wants to reach a wide audience, shares are a lot more important than likes or favorites. From the research above, we’ve learned that people love sharing interesting, important and funny content. Essentially, people love quality, so putting in that extra effort to increase the quality of the content you create could mean everything for your brand. We also know that emotion drives sharing. Look at brands who excel at content marketing, from WestJet to Adidas. See how they play on our feelings: sadness, joy, love, passion, excitement. Do everything you can to tell stories that evoke these same feelings, and you’ll dramatically increase the likelihood of your content being shared. For more on creating shareable content, check out Cameron Uganec’s series on Social Media and Storytelling. Start managing your social media presence with Hootsuite Pro!